It’s trendy and popular right now. But what is it and how does it differ from regular broth. All broths are made from boiling food in water. But unlike a typical chicken or vegetables broth, bone broth is made from boiling mainly bones with little meat. The goal is to simmer the bone for a long time, anywhere from 14-48 hours to get as many amino acids, minerals and collagen out of the bones. Advocates will tout all kind of benefits it probably does not have. However, do not dismiss it either. The nutrients it does have are very nurturing for the gut and improving gut health can help all kinds of other conditions. Sometimes carrot, onions and celery are added for flavour and more nutrients. By adding apple cider vinegar, you can help draw out the nutrients from the bones. There are no current studies to support the benefits but do we need them? Soup does not have studies and we know that it’s good for us. The problem with studying gut health foods is the complexity of the gut. There is no magic bullet for fixing the gut. It requires a number of strategies. Consuming bone broth, which contains valuable nutrients that the gut needs, can help. It is also soothing and nourishing. It feels good when you drink it. 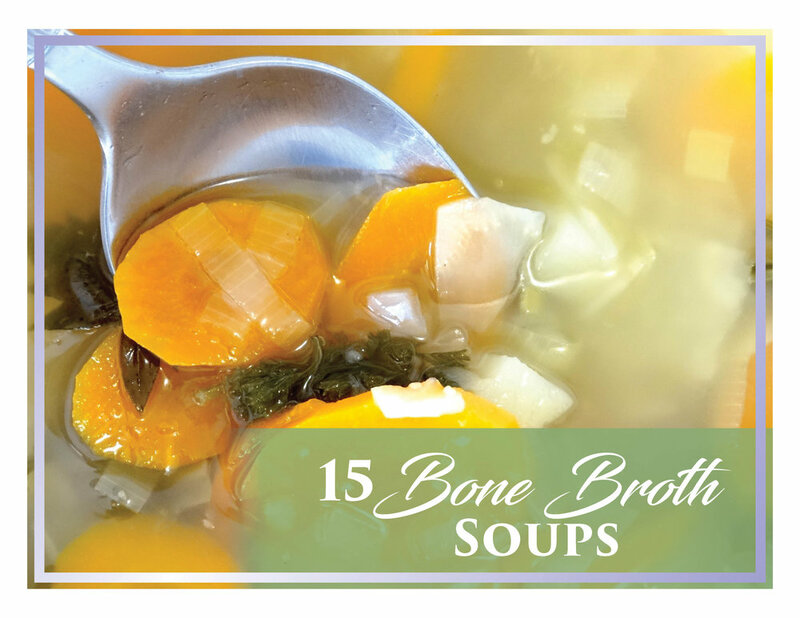 More importantly, you can use bone broth to make amazing soups and stews. Too busy to make a recipe? Just drink it as a beverage. Heat the broth and add some sea salt, pepper and your favourite herbs. Then sit down and relax. Sip the broth and savour the flavour, just as you might a tea or coffee. And, as you enjoy the broth, you have the pleasure of knowing that you are getting all kinds of minerals and amino acids that your body will love, too. My Best Broth Tip: Be sure to simmer the broth long enough that the water level drops by half. That is when you have finally cooked out the taste of water. Heat the olive oil in a medium-sized saucepan over medium heat. Add the garlic and parsley. Lightly sauté. Add the broth and arame or nori and simmer for 3 minutes. Add the bok choy and green onions. Lightly cook. Remove from heat and add the noodles and lime or lemon juice. Add the miso paste and adjust the taste to your liking. Sprinkle on hemp seeds. Season with black pepper. Serve.